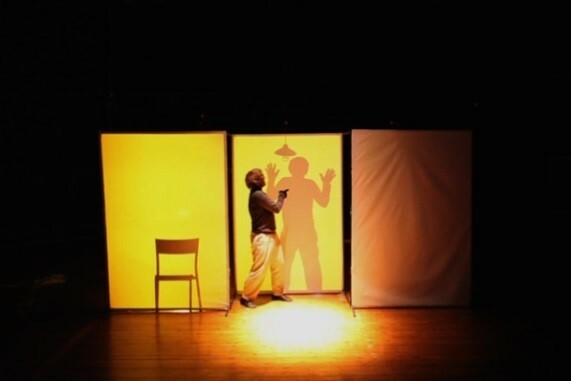 IAM4Mime is a live performance of mime mixing a dynamic set configuration with interactive video projection. 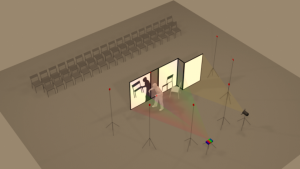 Behind a projection screen, a mime dialogue with real, virtual objects and its interactive silhouette creating illusions between them. The creation was influenced both by two universes: that of the Mime and that of the traditional Chinese shadow theater. The concept here is to highlight the body through its silhouette using few artifacts in the background, rather colored solid areas. The pantomime is punctuated by sound compositions inspired by Gypsy music and improvisations on the piano. This spectacle of twenty minutes immerses the spectator in a confusion between reality and virtual reality.